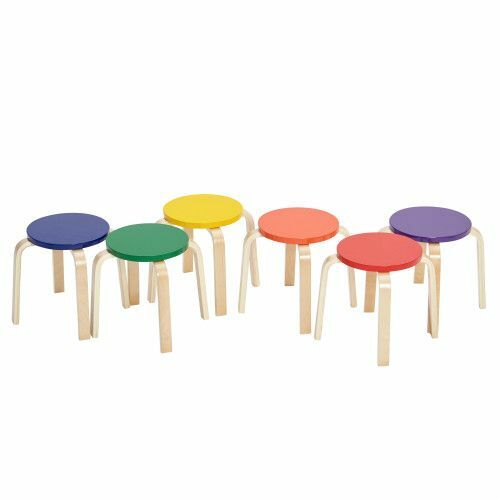 The 6-Piece Bentwood Stool Set is just the place for little ones to meet up for story time, manipulative play, and more. Perfect for home or school use, the contemporary design includes six 12” bentwood stools for quality time with a buddy and a puzzle. The legs feature an attractive natural finish and come with your choice of top color: Natural (-NR) or Assorted (-AS). 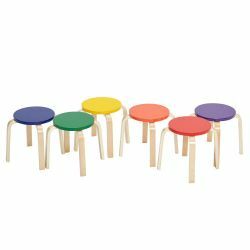 Assorted includes one of each attractive color: red, orange, yellow, green, blue and purple.Stools stack nicely to save space when not in use. Pair with the ECR4Kids All-Purpose Play and Work Activity Tables for the perfect set.